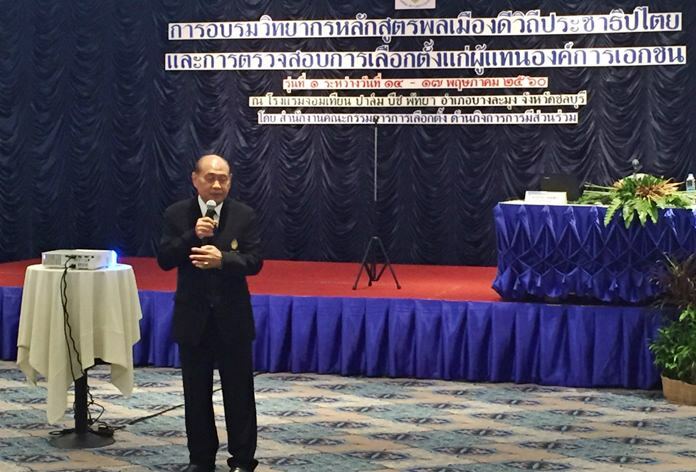 While no ballots will be cast in Thailand for at least a year, the Office of the Election Commission hosted a seminar in Jomtien on democratic processes and election verification. Commissioner Pravit Rattanapien chairs a seminar in Jomtien on democratic processes and election verification. Commissioner Pravit Rat­tanapien chaired the May 15 meeting attended by about 70 election committees from 17 provinces and private organizations. Commission associate secretary Maetha Silapan said the event was to prepare personnel of private organizations for elections when democracy eventually is returned to Thailand. The panel believes providing knowledge to the public is important. He said there is a need for practice rounds to train the various individuals from the government and private sectors. It’s seen to be of high importance because not only can the knowledge and understanding of democracy and elections be reached by new committees, but they can also become strong and operate properly in accordance with the law. Private organizations can monitor election quality, including the enhancement, so information is conveyed accurately.